Back in those austere postwar years when the overwhelming majority of new vehicles were immediately exported to help Great Britain recover from the War, there was a shortage of commercial delivery vehicles. 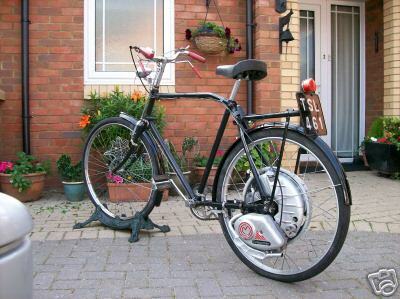 That's when the Mercury Cycle Company, in conjunction with Cyclemaster Ltd, brought out the Cyclemaster Roundsman 32cc Delivery Bicycle. 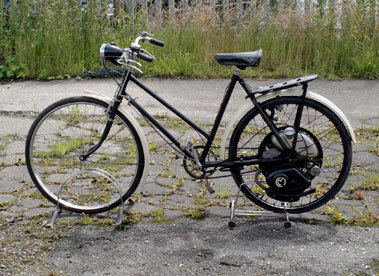 Cyclemaster Ltd was owned by EMI, and they published quarterly magazines devoted to the Cyclemaster. Every issue of the Magic Wheel is reproduced in full on the Cyclemaster Museum website; they provide a fascinating insight into motoring in the 1950s. 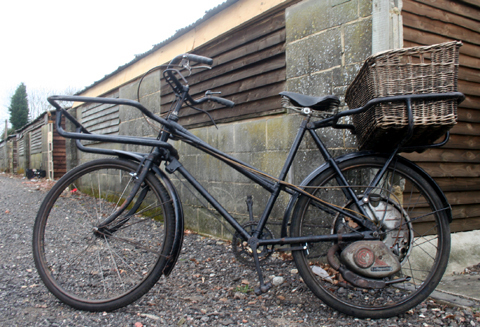 1950s Cyclemaster Roundsman 32cc delivery bicycle. 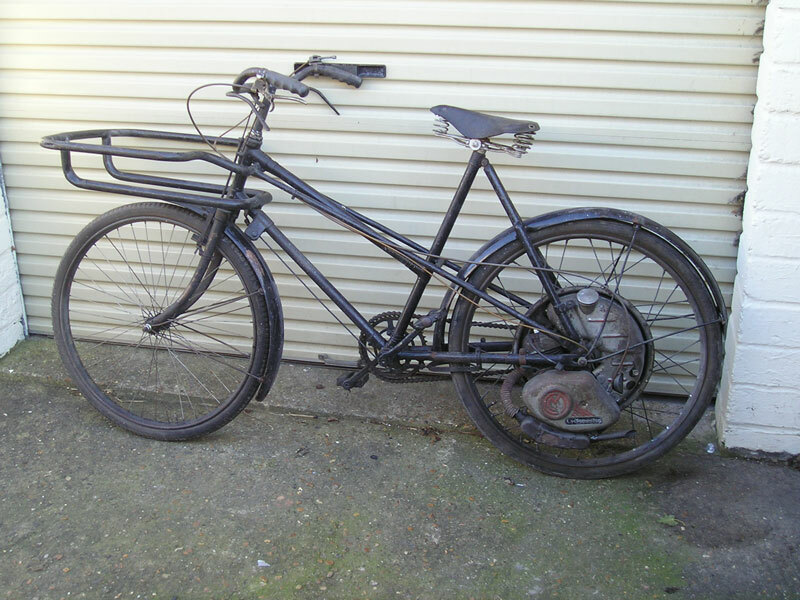 This extremely rare model of Cyclemaster Roundsman has double the carrying capacity, being built with extra lugs on the rear to mount an extra carrier behind. 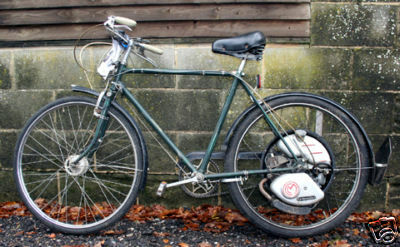 1951 Cyclemaster, on a 1954 Raleigh All-Steel Bicycle. 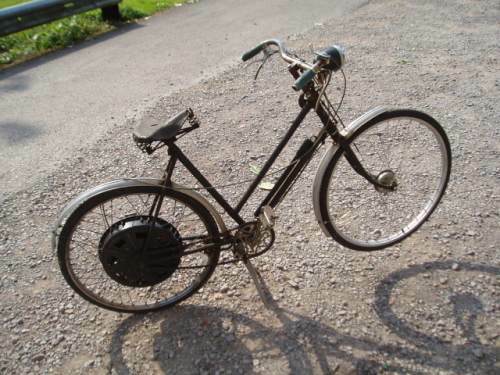 It has a genuine accessory Sturmey Archer front brake, which is more powerful than normal bicycle brakes. 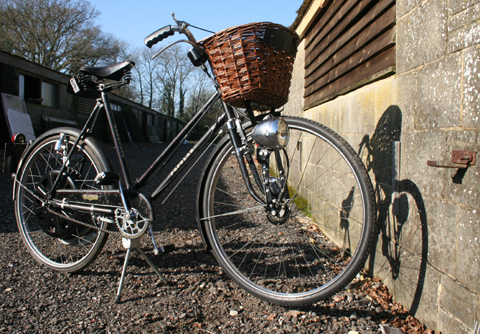 The Raleigh All Steel Bicycle was one of the most popular models in the sixties, and is suited to motorization because it is such a well-built frame.The All Steel model was made until 1960 and was exported all over the world. 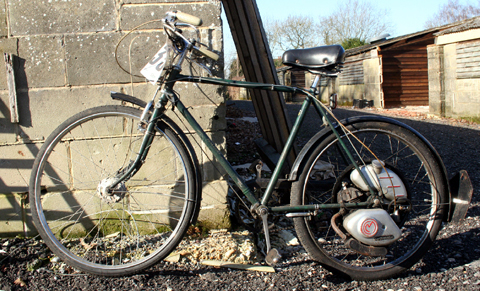 1954 Cyclemaster on 1949 Hercules Popular Ladies Cycle. 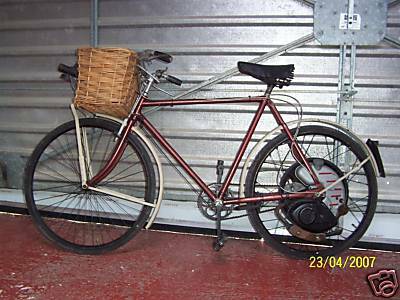 There's a basket, Smiths speedo, lights, number plates front and rear, Brooks saddle, and tool pouch behind the saddle.